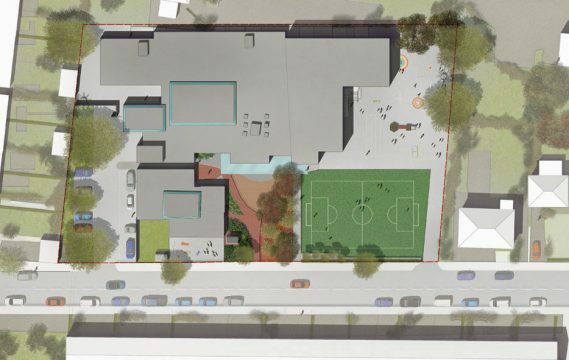 We were appointed by a contractor client as landscape architects on this 0.53ha school site. Our scope was to develop a landscape design to the satisfaction of the school and the contractor. We then proceeded to provide landscape architect ’s information to satisfy landscape related Conditions, provide a full package of landscape architect ’s tender and construction information and to monitor the external on site works as they progressed. The main contractor was appointed to refurbish the existing school building, provide an extension to the existing school and to improve the existing external works, ensuring they tied into the newly extended school building. The site is approximately flat with a number of mature trees to the east and west boundaries and a group of young trees grouped around the main building’s entrance. There were areas of tarmac and grass used for play areas, and various items of street furniture which were to be reused. In order that the school could remain open while the building works were being carried out it was necessary for the contractor to occupy the playground to the east of the site. In order that this could happen it was necessary that the car parking at the west of the site be given over to a temporary play ground. 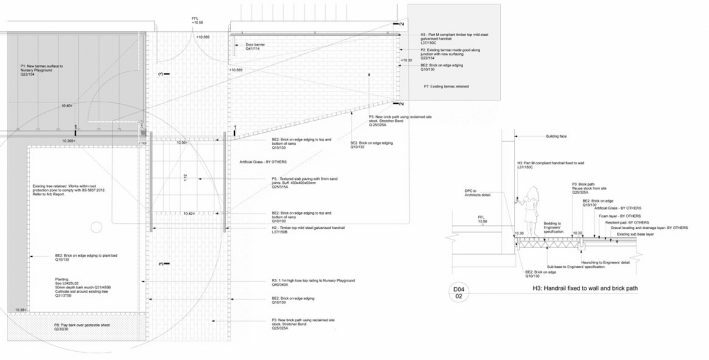 Our landscape architects were responsible for providing phased drawings and specification to enable this to happen in a considered manner. The play area for the youngest members of the school was too small for the number of children it needed to accommodate. 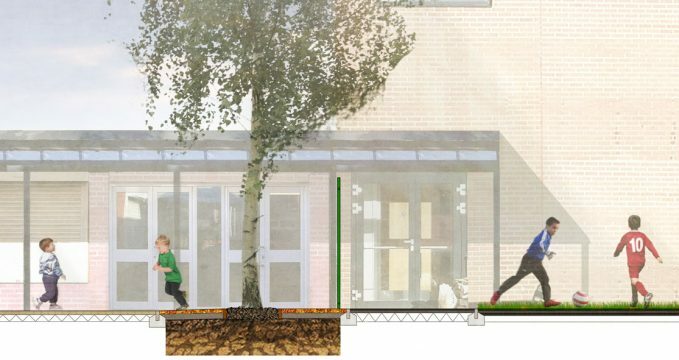 Our landscape architects therefore needed to develop a landscape design strategy to enable the existing play area to be extended into the zone which accommodated the existing stand of trees. Our landscape architects specified a no dig solution within the root protection areas of these trees. The proposed surface finish was composed of a coloured rubber bound chippings. These details ensured the existing trees continued to thrive whilst providing the school with more usable space.